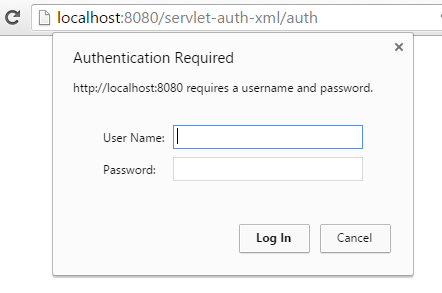 This tutorial introduces how to do Servlet Basic Authentication Web.xml configuration. With basic authentication of a servlet, the web browser presents a standard login dialog that is not customizable. When a user submits his or her name and password, the server determines whether the user name and password are those of an authorized user and sends the requested web resource if the user is authorized to view it. His or her name and password automatically gets Base64 encoded which do not mean that it is safe. Base64 encoding can be easily decrypted. This is eleventh post of series of Java Servlet Tutorial. This series tutorial will provide you full knowledge about Servlet 3.0. 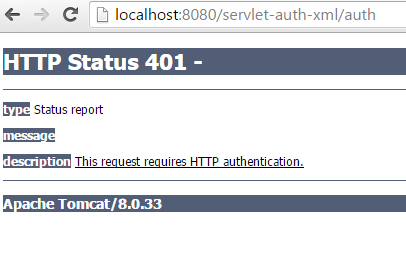 We are using Tomcat 8 to do the Servlet Basic Authentication Web.xml configuration. We use tomcat-users.xml file to register a username/password combination with the appropriate row. This file is located at ../apache-tomcat-8.0.33/conf/tomcat-users.xml. We suppose that you know about the servlet registration already and we only focus on the servlet basic authentication configuration. To enable basic authentication for the service, we must add security elements to the application deployment descriptor, web.xml. The security elements that need to be added to the deployment descriptor include the <security-constraint> and <login-config>elements. Each <security-constraint> element must have one or more <web-resource-collection> elements. These define the area of the Web Application to which this security constraint is applied. <web-resource-collection>: A list of URL patterns (the part of a URL after the host name and port you want to constrain) and HTTP operations (the methods within the files that match the URL pattern you want to constrain) that describe a set of resources to be protected. <login-config> specifies type of authentication that we are going to use. In our case we will configure the BASIC config. That’s all on how to do a Servlet Basic Authentication Web.xml Configuration in Java. You can also find other servlet example in the series of Java Servlet Example. Hope that it is useful to you.